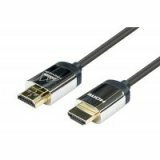 CYP HDMP-050M is a certified Premium HDMI Cable, fully supporting 4k UHD and HDR (High Dynamic Range) AV content. CYP HDMP-100M 1m is a certified Premium HDMI Cable, fully supporting 4k UHD and HDR (High Dynamic Range) AV content. CYP HDMP-200M is a 2m certified Premium HDMI Cable, fully supporting 4k UHD and HDR (High Dynamic Range) AV content. CYP HDMP-300M is a 3m certified Premium HDMI Cable, fully supporting 4k UHD and HDR (High Dynamic Range) AV content. CYP HDMP-500M is a 5m certified Premium HDMI Cable, fully supporting 4k UHD and HDR (High Dynamic Range) AV content.